Green House Hostel is not only your place to stay overnight, it’s also your place to meet new friends! Because we believe a stranger is just a friend you don’t know, the hostel was conceived as a relaxed hangout for travelers from all over the world. There is a large common lounge area for guests to relax in, as well as a leafy garden with outdoor furniture at the property. There is plenty of room types to choose from: 4 beds female dorm, 6 beds, 8 beds and 10 beds mixed dorms and also matrimonial rooms for couples. Each room is equipped with free Wi-Fi, air conditioning and high-pressured hot showers. Our custom made bunks are specially designed to offer our travellers a comfortable night sleep with privacy. If you get inspired by the flavours of Dushanbe and feel like cooking simply step into our fully equipped kitchen and save the extra cash by eating in! Good place with a prepared and available staff. When we stayed there it was full of bikers and Mongol Rally teams heading to the Pamirs, which gave the place a very good atmosphere. The position is good but not right in the city center, anyway taxis are very very cheap! Really helpful English speaking staff, good location, comfortable beds, good wifi, kitchen and bathroom. Excellent value for money. Good value for what you get. Not too close to center, but only a short bus away. Hot showers, nice minimalist free breakfast, close to shops and very helpful staff. Met Pamir friends easily here. Lovely place to stay and very helpful staff. This is one of the most popular places for backpackers, travellers, cyclists and bikers alike. Very decent. Great place to meet travellers of any kind. Lots of cyclists, motorcyclists and 4x4 travellers here. Maybe better location for the airport than for the city centre. 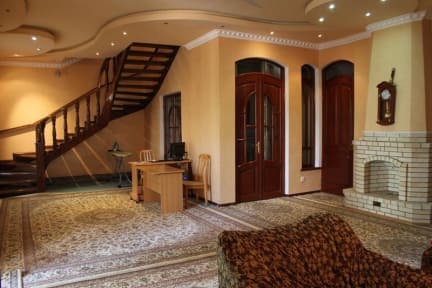 Good and cheap hostel, I come there every time when in Dushanbe. Nice vibe. Stayed here for one night whilst on the Mongol Rally. We arrived late and left early, so didn't spend much time here, but the staff were really helpful. The location isn't great, but there was a good atmosphere - We already knew a few people from the rally, so we might be biased, but there was generally a nice vibe with cyclists and backpackers also. Only issue was the bed: The most uncomfortable bed I have ever slept in. Ever. Would rather have camped it was so bad. Good experience otherwise.